The heroine in Jael McHenry's debut novel, The Kitchen Daughter, is Ginny Selvaggio, a young woman with Asperger's syndrome, a high-functioning form of autism characterized by significant difficulties in social interaction and repetitive patterns of behavior and interests. Ginny's long time special interest? Cooking. The process of following a recipe—its rhythm, its order, its predictable result—is calming to her, so when she finds herself overwhelmed, embarrassed, or uncomfortable she copes by turning to food, either in the kitchen or in her mind. The onions, I need the idea of the onions, I soothe myself with it. Slowly growing golden. Giving off that scent, the last of the raw bite mixed with the hint of the sweetness to come. I press my forehead down against my knees, crushing the boots between my chest and thighs. My forehead is hot. My knees are hot. Thin, long strands shaved on a mandoline start as solid half-moons and melt away over time. More salt? No, just patience. Stir. Wait. Adjust the heat. Wait. Stir. The way Ginny processes the world around her is through food. Her sister, Amanda, has a voice like orange juice, sweet but sharp. Her father's voice is tomato juice. Their shoes are black like licorice or brown like brisket. . . I feel the warm breath of someone's solid bread-dough bulk, only a couple of feet away. . . his head as pale and moist as a chicken breast. . . his breath smells like bean water. . . When asked why she chose to give her main character Asperger's, Jael says, "I started developing this character who loves food and loves cooking, but is completely closed off from the world, a young woman who just can't connect to people. "Because food is such a wonderful way to connect, I wanted to create this conundrum, this person who doesn't use it to connect, has never used it to connect. She needed to have a real obstacle that kept her from connecting; it couldn't be something she could just 'get over.' I was just becoming aware of Asperger's and what a spectrum it is, how it manifests so differently in different people. It fit the story I wanted to tell so perfectly, and then along the way it became the story I wanted to tell—and now I can't imagine Ginny any other way." 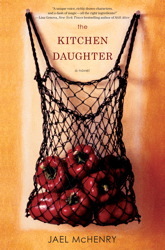 The Kitchen Daughter begins after the unexpected death of 26-year-old Ginny's parents, and when she turns to the kitchen for comfort, Ginny discovers that she can conjure up ghosts by making their handwritten recipes, which brings a magical twist to the story. Food is ever present in this book about grief, self-discovery, and the connections between food and memory and family and identity, but, as someone who most people probably wouldn't consider 'normal,' my favorite part is the Normal Book that Ginny, an avid reader of advice columns, has kept for years. There are so many flavors of normal, it doesn't matter which one I am. That's what the Normal Book tells me. There really is no normal. Jael McHenry is a talented writer who has created a unique first novel filled with interesting characters. I think I would have enjoyed the book more if I had read it 15 or 20 years ago when I was in my 20s, but I'm glad I read it, and I bet a lot of people will really like it. Each chapter in The Kitchen Daughter is named for a food and begins with a handwritten recipe: Shortbread, Mulled Cider, Biscuits and Gravy, Omelet, Butternut Squash Soup. I haven't had a chance to try Ginny's Ribollita yet (I love the idea of making croutons out of onion focaccia), but there's always time for a quick batch of brownies, and I was intrigued by the use of raw sugar, a bag of which I just happened to have on hand. Ginny is able to lure ghosts to her kitchen by following their recipes exactly. An enviable power to be sure, but since by choice, force, or incompetence I always seem to veer away from a recipe's instructions in some way, I have no hope of ever achieving it. Despite reading this recipe at least three times before and during baking, it wasn't until I started typing it out here that I realized I was supposed to sprinkle the salt on top of the pan of batter. Oops. These are short, cakey brownies, with a deep mocha flavor. While they aren't the best brownies ever (I'm still searching for that recipe), they're pretty darn good, and mix up quickly to satisfy a chocolate craving. They taste even better the next day and are greatly enhanced by a glass of ice cold milk. Melt the butter (I microwaved it) and stir in the cocoa and espresso powder. Let cool slightly. In a large bowl, beat the eggs with a whisk for about a minute, then add the sugar and whisk a little more. Use a rubber spatula to add the butter mixture and vanilla, and mix until combined, then stir in the flour and salt (or sprinkle the salt on top of the pan of batter, as noted above) and mix until just combined. Pour the batter into the prepared pan and bake for until a toothpick inserted in the center comes out clean, about 20 minutes for a 9-inch pan; longer for an 8-inch. For my participation in this TLC Book Tour, the publisher provided me with a review copy of this book. © FarmgirlFare.com, living a crazy country life on 240 remote Missouri acres, happily surrounded by books. I'm so glad you enjoyed the book! It sounds like the author got the character's voice (the girl with Asperberger's) just right. Thank you so much for being on the tour and sharing your thoughts on The Kitchen Daughter with your readers! The links do not lead you directly to the book on Amazon, just to let you know. Thanks for the review and the recipe. I can't wait to try the brownies. An interesting style and approach to your book. Thanks for letting me know - I really appreciate it. Something went wrong with amazon's link code, but they should be working now.